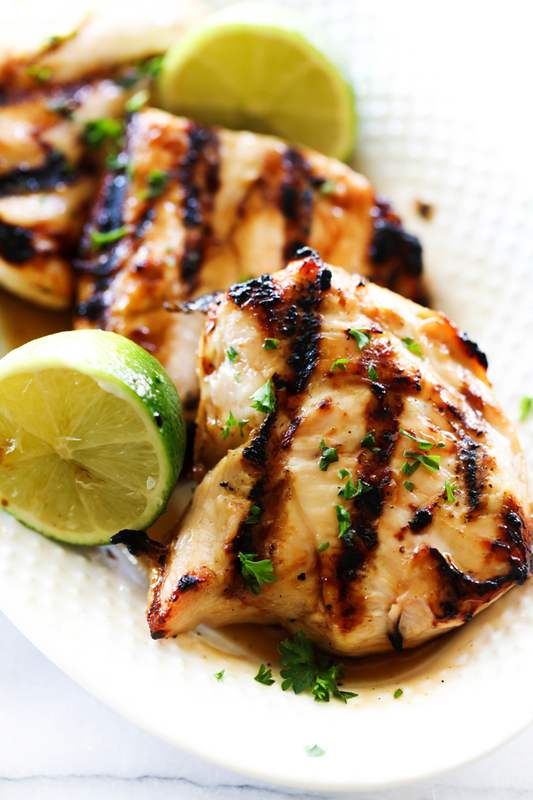 This Easy Honey Lime Grilled Chicken is sweet, citrusy and perfect for the warmer weather. It has a delicious marinade that is infused into each bite of the tender chicken and is topped with an additional honey-lime glaze. It is super simple to make and will become a new regular at your house! This pregnancy I have been craving fresh and sweet things. This Honey Lime Grilled Chicken recipe was a perfect combination of those two adjectives and fused them together beautifully in this simple yet restaurant worthy recipe. This received great reviews from my entire family. The citrus and sweet honey create a heavenly bite as each of those components is infused into each bite of chicken. The prep work is super easy and doesn’t take long at all. This recipe was adapted from my Cilantro Lime Grilled Chicken and was a wonderful change up to the usual. In a Ziploc bag, combine lime juice, salt, honey, oil, soy sauce. Seal tight and shake until well combined. Add chicken and marinate for 3 to 4 hours, or over-night. Heat grill to medium heat and grill chicken until done. While the chicken is cooking, combine glaze ingredients in a small bowl. After chicken is removed from the grill, brush generously with glaze and serve. I'm sorry....how much chicken did you use please?? Thank you!! Love the idea ! Just on time for a weekend ! Thank you! This was absolutely fantastic..I will use this recipe often!! !